Bronze AE3, 20mm, 2.86gm, issued AD 328. Arelate mint. Obv: CONSTANTINVS IVN NOB C, Laureate, draped and cuirassed bust facing left. Rev: PROVIDENTIAE CAESS (TCONST in ex. ), Camp gate with two turrets. Star above, S in left field, F in right. References: Sear 17224, RIC 319. 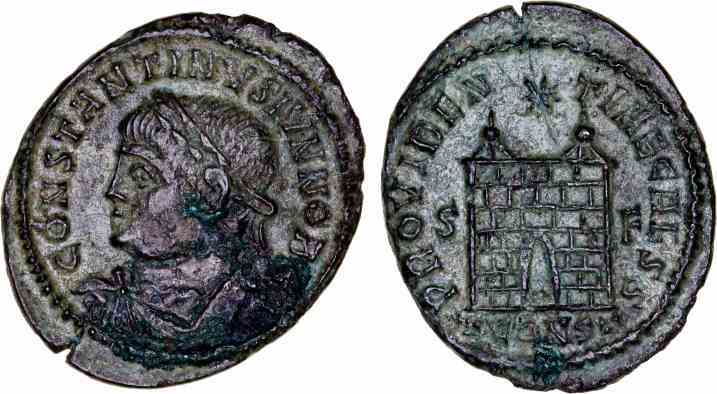 The city of Arles, where this coin was minted, was renamed Constantina in honour of Constantine II in 328. The mint marks for this city went from AR or ARL to CONST.